How to choose stone CNC router tools? How to choose tools for stone CNC router? Stone CNC router is usually equipped with those cutting tools? Broadlydivided, stone CNC router tool generally has the following categories. Metallurgical melting knife diamond grinding, using military high-tech "Metallurgical melt diamond technology" manufacturing, with good sharpness, high efficiency engraving, blade deformation, carving high precision! Therefore, carved marble, bluestone, sandstone and other materials, often used as a tool of choice for high efficiency relief is also engraved characters weapon. Overall alloy triangular knife ultra super wear-resistant alloy particles. Wear resistance is much higher than other market triangular knife. Angle standard lettering effect! There Universal Grinder customers can use this knife. No Universal Grinder, and is not recommended. Imported polycrystalline diamond blade, blade comparable domestic quality is far from cheap! Vacuum welding technology, do not damage the blade does not fall off; microscopic grinding technology makes the sharpness of the blade, the strength is optimized. Usually used for small print engraved granite. Hardness, high life expectancy and good engraving effect. When used, it should be noted flex pass, the knife can not be too much. Sintered diamond grinding is generally used for granite milling bottom. Since the head of a multi-layer sintered diamond has a very high life! The disadvantage is that the sharpness is not high, the tip will be deformed. Therefore, carving marble, bluestone and other materials, in order for you to achieve higher outputs and carving effect, does not recommend the use of sintered knife. Do granite and other hard stone processing, in order to avoid the exorbitant costs of the tool, the choice of sintering grinding knife. Usually made of granite engraved with small print or line engraving. The advantage is a higher life, the disadvantage is the relatively poor sharpness, engraving shallower depth. 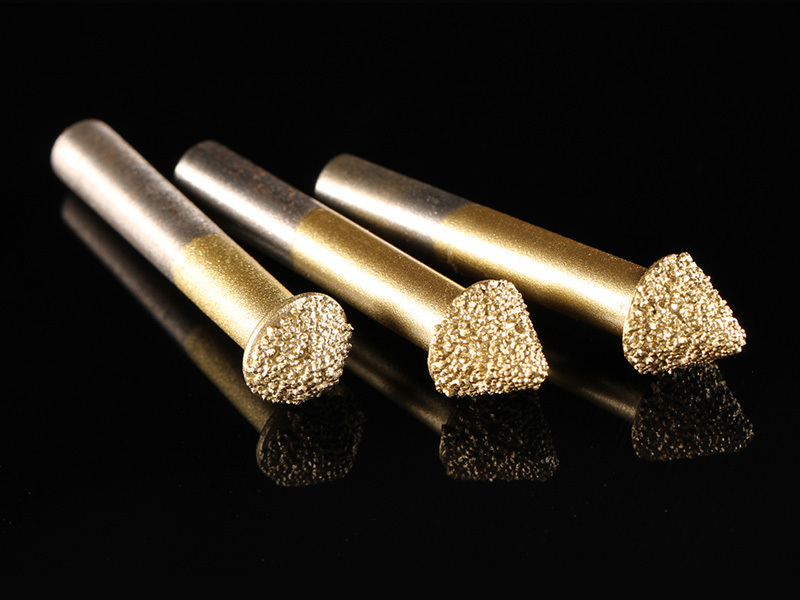 Such stone carving tools using high-performance alloy, double-edged design, sharpness is good, cost-effective, easy manual regrinding. Disadvantages: This type of knife since the angle of non-standard (there is another tip at a large angle), not suitable for relief. Usually used for carving bluestone (Stone Carving sample display), marble, white marble sculpture. In short, there is no perfect stone knives, stone carving tools in selecting the time, only with a reasonable tool in order to achieve optimal engraving. License: The text of "How to choose stone CNC router tools?" by STYLECNC is licensed under a Creative Commons Attribution 4.0 International License. • Next: Who needs a CNC router machine? How to buy a wood door CNC router? How to use a Rotary Axis CNC Router for Crafts? Please consciously abide by the relevant laws and regulations of the Internet, is strictly prohibited to publish pornographic, violent, reactionary remarks. Your name is not open. If you don't want your name to be known by STYLECNC administrator, please checked Anonymous. Get Answers to Your Questions about our CNC Machines or a Quote, Call or Email us.